« What can you do with an ISBN? If you need to go beyond what Google Patent Search can deliver, you could consider LexisNexis TotalPatent, a pay service. If you have to ask how much it costs, you can’t afford it (unless you’re a Patent Attorney). Exclusive back files – we have patents that go back as far as 1836 for the US patents. The European Patent Office is 1978; World Intellectual Property Office is 1978; Great Britain is 1890 and the Netherlands is 1915. In some cases, TotalPatent actually has more documentation of these patents online than the national patent office. For example, we are loading the full text of Granted patents published by the British Patent Office back to 1979 that are unavailable from any other source, including the British Patent Office. We are able to do so because we had heard a library was going to throw away their older patent records due to a space problem. 65 million compressed, multi-page, searchable PDF documents. Prior-art content from Elsevier Science Journals. World’s largest collection of searchable full-text and bibliographic patent databases—in the language of publication and English translations—including images, citations, legal status and patent family collections. Alert and profiling tools used to monitor industry trends and technology issues, allowing the user to stay ahead of technological developments and competitive activity. This entry was posted on Thursday, September 27th, 2007 at 5:09 pm	by eiffel	and is filed under Research Resources. You can follow any responses to this entry through the RSS 2.0 feed. Both comments and pings are currently closed. Another great source for patent searching is http://www.wikipatents.com. 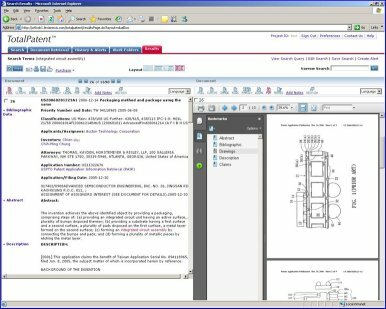 WikiPatents has the largest database of patents open for public comment on the internet, allows PDF downloading of patents, free patent translation into multiple languages, and additional information and resources. It is the best free patent site on the web.